Sports Psychology is an interesting branch of the Psychology tree for a number of reasons. But it is most interesting because the psychological and educational community can’t agree on how to treat the discipline. There currently isn’t a hard or fast or even agreed upon educative model for those interested in undergraduate and graduate training in the subject. This hasn’t stopped from dozens of schools from creating specific undergraduate and graduate degree programs in the field. There is no doubt that in order to successfully launch oneself into the professional community, a Master’s degree or PhD is required. However, not everyone is positive they want to be a sports psychologist and enrolling in an expensive and work-intensive graduate degree program isn’t the best way to gauge one’s interest. This is why some enterprising universities have begun to offer Bachelor’s degrees specifically in sports psychology. These programs aren’t the only way to ensure a career in the field but they will give students an understanding of the subject and foundational knowledge of the field. However, because there are still no legal standard for what makes a good sports psychology degree program, students need to be careful before they sign up for a program. There are a number of programs where the degree is actually in Exercise Science or Kinesiology, which are related fields, but not sports psychology. Internships, balanced degree requirements, retention rate and student outcomes are all things that interested parties should ask about before they pick a degree program. Those traits are just some of the ones we looked for when we put together a list of some of the best undergraduate sports psychology degree programs in the country. Within the School of Human Performance and Leisure Sciences as Miami’s Barry University is a program that allows students to major in “Sport, Exercise, and Performance Psychology”. One of the only programs of its kind in the Southeast United States, the program at Barry requires students to also earn a minor in either psychology or business management to ensure students still receive a well-rounded education. The program is specific to Sports Psychology which means not only that all of the professors are certified consultants with the Association of Applied Sports Psychology (AASP) but it also means that students conduct research projects, participate in community service and get real-world experience that is also specific to the discipline. Students are asked to conduct their own research and develop interventions. Classes include the basics as well as courses in nutrition, adapted physical activity, psychology of injury, hyperbaric physiology and much more. The school is also home to a state-of-the-art Performance Behavior Lab that aids students in their research and that is not all the facility is used for. The building also contains observation rooms, video analysis rooms and exercise rooms where experiments are conducted. What separates Barry’s program from others is that they set out to be the industry standard in sports psychology education. They didn’t just make it an option. They committed to making it a full-time degree program and as a result, it has some of the best resources and faculty members of any program of its kind across the country. SUNY-Fredonia - NO LONGER AVAILABLE. WAS WHEN ARTICLE WAS WRITTEN. One of the smaller and lesser-known SUNY schools also happens to be one of the only schools on the entire East Coast with a Bachelor of Science degree program in Sport and Exercise Psychology. There are no official competencies for sports psychology degree programs but in an effort to do some standardization, the AASP created a list of guidelines and SUNY-Fredonia crafted its coursework with those guidelines in mind. Some may not view this as a good thing, but at least it ensures students that thought and care have gone in to the planning and creation of the program and its coursework. Students will leave school with competency in: professional ethics and standards; education in health and exercise psychology and performance enhancement; basic counseling skills; and much more. What makes SUNY-Fredonia special as well is that the school and the program coordinators strongly believe in the importance of independent study and an internship. Every graduate program in any type of psychology will require students complete an internship, but it is rare to see undergraduate programs facilitate those opportunities. Fredonia doesn’t require its students to graduate with internship experience, but students are highly encouraged to participate in an internship in the community or an independent study project before they graduate. The program coordinator, Bruce Klonsky, is not only an experienced psychologist with a wealth of published research on various sports psychology topics but also a well-liked teacher for his sense of humor, tough grading standards and willingness to work with students to craft the most worthwhile degree in the subject. The hope is to soon be able to fold the program in to the Department of Psychology, obviously adding even more legitimacy to a growing program. Try and keep up. The Bachelor of Science degree program in Sports Psychology is housed in the Department of Kinesiology, which is a subsection of the Harris College of Nursing and Health Sciences. Now that the basics are covered, know that the sports psychology program at TCU is one of most comprehensive and well-regarded programs in the discipline around the country. The school designed the program to help those pursue a graduate degree in sports psychology. The core curriculum ranges anywhere from 40 to 60 credit hours and the major is 47 credit hours plus psychology-specific credit hours in courses like social psychology, abnormal psychology and elementary statistics. Students create and engage in research projects and an internship isn’t just encouraged, it is required as a part of the major. Like Barry, TCU also has a sport psychology lab with impressive resources for students. The school uses the lab to focus on specific types of research and testing, but students enrolled in the program can be sure they will use the lab extensively. TCU boasts that graduates of its programs are employed at colleges, hospitals, rehab centers, sports organizations and many other places. It also brags that graduates of just the undergraduate degree program have gone on to be sports psychology consultants, lab technicians, school counselors, teachers and even academic advisors. In many ways, the program has the same educational material and requirements as the traditional psychology degree, which is kind of the point isn’t it? At this rural university in Colorado, the sports psychology degree program is actually a cooperative effort between the Department of Human Performance & Physical Education and the Department of Psychology. It is a relatively new program that the school says offers students the opportunity to learn more about psychological concepts and how they work within the context of sport and exercise. Like all of the best programs in the discipline, Adams State recognizes that most jobs in sports psychology will require a graduate degree and thus caters to that idea. It is a standalone degree but the program was developed with the idea in mind that students would use it as a foundation for graduate study in the subject. They use self-generated competencies to achieve that goal and those competencies include: developing and applying health, physical activity, and psychological principles; designing and conducting research in the field; demonstrating written and oral skills; and explaining the major perspectives of psychology. They are able to accomplish these competencies with a comprehensive and formalized degree plan that includes a minimum of 120 credit hours including at least 42 credit hours in upper-level classes. Students must also demonstrate writing proficiency by the end of their sophomore years. The school also opened a Human Performance Lab in 2013 that is big enough to accommodate as many as 20 students at one time. The lab boasts a pair of treadmills, exercise bikes, an ergometer, three computer stations and other equipment. It is used to not only test the athletes but also allows students to have access to resources that are important for the research. At this point it may sound repetitive but these programs are at their best when the school developing them has a deep understanding of how to appropriately teach sport psychology and it clear based on the comprehensive program built for its students that Adams State knows what it is doing. National University was one of the first universities to truly embrace sport psychology as a potential degree path and it shows. Not only does the university offer an undergraduate, a graduate and a PhD program. But it also offers all of those opportunities in traditional and online formats, allowing students more flexibility when it comes to choosing their path. The degree program at National University is even more specific than most programs in the discipline. Students do take an introductory classes in probability as well as psychology, but after that, the coursework is almost exclusively related to sport and exercise psychology, applied sport psychology and sports psychology culture. There are, of course, a minimum of 70.5 credit hours of general education requirements as well. The university also owns the Center for Performance Psychology in San Diego, a state-of-the-art facility that blends athletes, coaches and organizations with resources, research efforts and leading experts in the field of sport psychology. The Center is also home to the annual Performance Psychology Conference, which attracts more than 1,000 industry leaders every year. Also, the university system is responsible for publishing and editing the Journal on Performance Psychology, which students at National University have unparalleled access to during their time at the university. National was one of the first places in the country to really understand the need for sports psychology education and act on it. As a result, the school’s degree program, faculty and research have all been at the forefront of the growth explosion the industry has undergone in the last 15-20 years. All of this is to say that the competencies set forth by the university – which include psychological research, analysis of psychological factors in sports, psychological theory and written and oral communication – were designed to serve as de facto industry standards. Now the university and its program are consistently recognized as one of the best in the business. The last of the specific sports psychology degree programs is coincidentally housed at perhaps the largest school on this list. West Virginia offers a Bachelor of Science degree in Sport Exercise Psychology and like many of the best universities offering these programs, West Virginia readily admits that its program is designed to prepare students for a graduate degree program. This means that when it comes down to core curriculum, there isn’t much of a difference between West Virginia and any other university offering a similar degree program. The difference is in the upper-level classes. Courses like Social Psychology of Sport, Performance Enhancement, Exercise Psychology, the Psychology of Injury, and African Americans in Sport aren’t necessarily unique classes, but they do show that West Virginia is committed not only to making the program specifically about sport psychology but that it is also thinking about creative ways to explore the discipline. Students still get a foundational education in sociology and psychology and they are also expected to complete an internship for credit – a hallmark of any good program in the discipline. Also, if students in good standing would prefer to complete a practicum where they work with doctoral students in the field by collecting research data and gaining skills that would be helpful for future studies. But my favorite part about West Virginia was reading one of the FAQs on the program website. When asked whether a Bachelor’s degree in the field would help a student land a job, the website answered simply, “No”. This type of honesty is rare but important, especially when sharing information about a nascent field. West Virginia understands where the discipline is at currently and caters its program to those restrictions. This ensures that students aren’t misled and are thus offered every opportunity to succeed and build a potential career. The sports psychology degree program at Arcadia University is unique in that it is a Majors Abroad Program. What that means is that in order to graduate, students need to spend a year of study abroad after completing the core psychology requirements at the main campus in Pennsylvania. At Arcadia, this means spending your junior year abroad at either the University of Stirling in Scotland or St. Mary's University College in London completing at least three courses in sports science or Sport Psychology. The senior year of the program is specifically designed for a focus internship and thesis on a specific topic, which is not generally something that undergraduate students need to complete and is one of the big reasons why Arcadia’s program has such an excellent reputation. Whereas other schools just set up the program to allow students to get a degree, Arcadia requires an internship and a thesis so that students are exposed to real-world experiences in the field and also get a crash-course in how to conduct research and then turn that research into a well-constructed thesis. The major portion of the degree requires 48-51 credit hours. As a freshman, students take social psychology and introduction to psychology classes. As a sophomore, students take classes like Behavioral Neuroscience, Elementary Statistics and Health Psychology. This is designed to ensure that students get a solid background in psychology-related fields first and foremost, which should be a staple of any decent sports psychology program. At Robert Morris, you cannot get a degree specifically in Sport Psychology. Instead you get a Bachelor of Science in Psychology with a concentration in Sport Psychology. This is an increasingly popular option for schools who recognize that students need a graduate degree regardless and most sport psychology graduate degree programs will accept students with a degree in general psychology. However, Robert Morris was one of the first schools to do it well and its attention to detail in designing the concentration stands out. What the program looks like for a prospective student is simple, generally speaking. Students take general psychology and research classes mixed with core classes as freshmen; they take more advanced psychology and statistics classes as sophomores; then they take sports psychology courses and electives as juniors; and finish their collegiate careers with a thesis and practicum and more sports psychology specific electives. In total, students need to complete 18 credit hours to earn the concentration and they also need to take biology or anatomy classes. Where Robert Morris doesn’t measure up is in terms of resources. 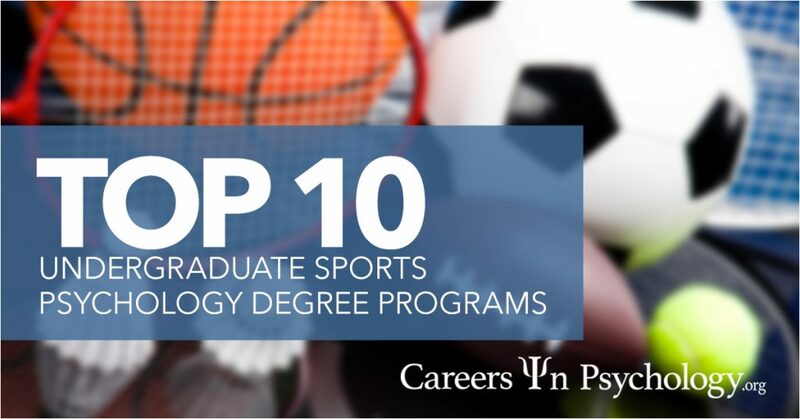 Most schools that have specific sport psychology undergraduate programs also have specific graduate degree programs in the discipline. As a result, it makes sense to build or maintain a performance lab or some sort of lab setting for student research. At Robert Morris, the concentration is the only sports psychology coursework offered. There is no lab for research and data. This shouldn’t preclude students from choosing the program. After all, it is still one of the only schools in the country with formalized coursework in sports psychology. It just means that if you are a student thinking about graduate options in the field, be prepared to look elsewhere. TAMU-Kingsville doesn’t offer a sports psychology degree per se. But what it does that makes it different from the schools that offer concentrations is that it makes sport psychology an optional degree path within its Department of Health & Kinesiology. The student gets a Bachelor of Science degree in Kinesiology, but they also have areas of focus within the degree that include Exercise Science, Physical Education, Sport Business and of course, Sport Psychology. What makes the program unique to some extent is that the degree plan requires a minor in psychology. The department has more than 30 courses that range from Applied Sports Psychology and Sport & Law to Biomechanics, Medical Terminology and Sport Economics & Finance and there will be a number of introductory psychology courses that will be required as part of the minor as well. The school aims to prepare students for careers in coaching and human services or graduate work in the fields of sport psychology and rehab therapy. The school also has graduate courses in Kinesiology and as a result, they have a Human Performance Lab comprised of one main lab, five smaller labs and a number of body composition tools. To put it bluntly, the lab is stuffed with state-of-the-art resources and equipment to help students with research, projects and to help athletes understand more about their performance and the psychological implications of it. This isn’t just some program created to fit the demand. This is a fully functioning department with quality faculty, abundant resources and a formalized education plan to help students prepare for their futures in the discipline. Another school where the degree is in Kinesiology and there is an option for a sport psychology concentration, Long Beach State actually gives its students multiple options within the discipline. Within Kinesiology, students can choose the option in Sport Psychology and Leadership. And then within that, students have the choice between two concentrations – sports psychology or leadership. If you needed proof of how high-quality the program is, just take a look at the prerequisites. Students must have at least a 3.0 GPA, at least a C grade or better in courses like Human Physiology, Human Anatomy, Introductory Psychology and Statistics for Everyday Life. Students also must take courses in written and oral communication as well as nutrition and even critical thinking. The department has more than six specific labs within the Department of Kinesiology, including one for sport psychology and it also offers a number of department specific scholarships. Clearly Kinesiology and its related disciplines is taken seriously at Long Beach State and any student that is interested in sport psychology should be excited by the school’s seemingly endless resources, commitment to excellence in its coursework and its willingness to work with students to ensure they jumpstart their career in sport psychology.